This chart shows the number of seats in the House of Representatives and U.S. Senate that the president’s party won or lost during midterm elections dating back to Franklin D. Roosevelt. Thanks to 56packardman for posting links to this blog on other car sites when relevant. I will return the favor and post a link to a piece that I found quite interesting, the subject of which was Studebaker and not Packard. “Necessity is the mother of invention” is a famous saying. Studebaker made some remarkable cars in the early 1960s, but was doomed anyway. If you build a better mousetrap the world will not necessarily beat a path to your door. From bankspower.com a picture of the “Hanky Panky” by Bruce Geisler. October 10?! Once again, Mittwoch (“Middle of the Week”) is the German/Yiddish word for Wednesday. Based on the specific “referrals” to the site, and as far as I can surmise, yesterday’s out of context post title (Mutant Zombies) may have attracted one or two readers who might not otherwise have read Disaffected Musings. Were any regular readers put off by the title? Bierce was a renowned writer/poet and a journalist who served in the Union Army for virtually the entire Civil War. In late 1913 he traveled to Mexico in an attempt to experience the Mexican Revolution first-hand. He was never seen again. Even noted finance publication Barron’s has taken note of the restomod industry. Long-time friend and Disaffected Musings reader Robert sent me this link. The article is about restomod Mustangs by a company called Revology founded by Tom Scarpello, a long-time auto industry veteran. What I found interesting and amusing is that the tone of this article makes it seem like Scarpello invented the idea of the restomod, even though that actual word is not used. Of course, restomods have been around a long time. Maybe people who read Barron’s have no idea. I’m still in a moratorium on writing about or showing C2 Corvettes. (Technically, I guess I just violated the moratorium.) I have been re-reading More Than They Promised, a history of Studebaker, by Thomas Bonsall. If I didn’t want to push away the rapidly increasing number of readers I would show a lot of charts from the book. These charts, on things like sales data and assets, fascinate me, but I’m more than a bit of an oddball as any regular reader knows. This is a photo (by yours truly) of a 1932 “custom” Studebaker St. Regis. By custom I mean the car has a non-standard body that includes extra-long doors. Most people think of Studebaker as a lower-price make and, of course, that was the reality for much of Studebaker’s existence. However, the real world is almost always more complicated than our distillations of it. People who engage in what I call impossible distillations of reality are usually off the mark. This car is quite handsome in person, but one would not expect to see too many museum pieces in a state of squalor. Once again, if you are a car aficionado please do all that you can, within your means, to support the hobby. That might include membership in an automobile museum. “Studebaker’s V-8 was one of the best engines of the era. We have pointed out in previous posts that it had one major design factor that severely limited Studebaker’s ability to expand it: the bore center spacing was such that the engine could not practically be expanded beyond 289 cubic inches. We perceive of that now as being a flaw in the design, but we need to understand the engineers’ reasons for designing the engine as they did. The engineers DELIBERATELY designed the engine to be limited in displacement. Deliberately?! Yes, because South Bend’s engine engineers had counted on postwar predictions from General Motors Research Labs that future gasoline octane ratings would soon rise above that of aviation fuel. Charles Kettering, GM’s research boss, saw higher octane ratings and higher engine compression ratios as the next big thing. Besides noting that history is replete with examples of the folly of human beings trying to predict the future, even when the arena is at least partially under human control, think about the ramifications of this point. Studebaker was in no position to cover the waterfront; that is, it did not have the resources to design multiple V-8 blocks. Chevrolet/GM could develop a small-block and big-block V-8 with different overall exterior dimensions, including different bore center spacing, and not just different displacements. Studebaker could not afford that approach. 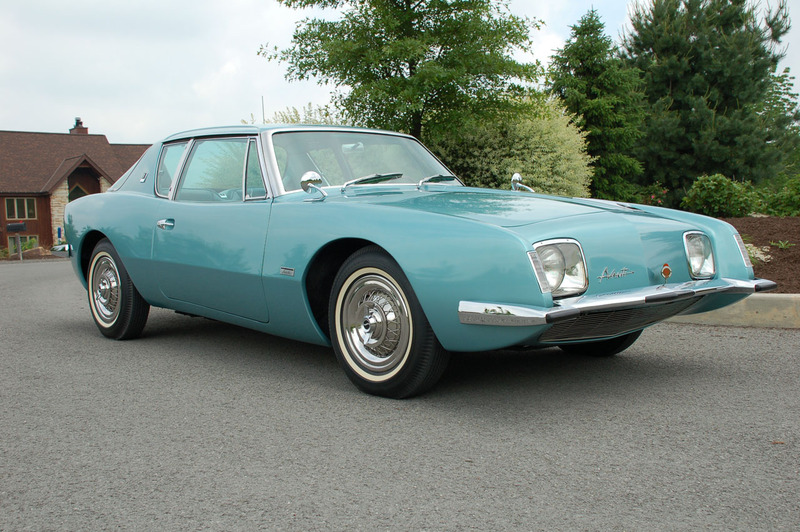 From autoblog.com a picture of a Studebaker Avanti. 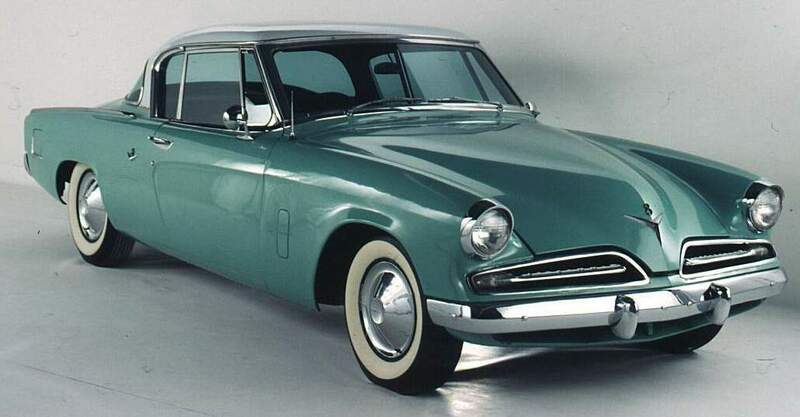 From conceptcarz.com a picture of a Studebaker Commander Starliner coupe. Not all of the posts are about Studebaker, but a lot of the posts are about automobiles.